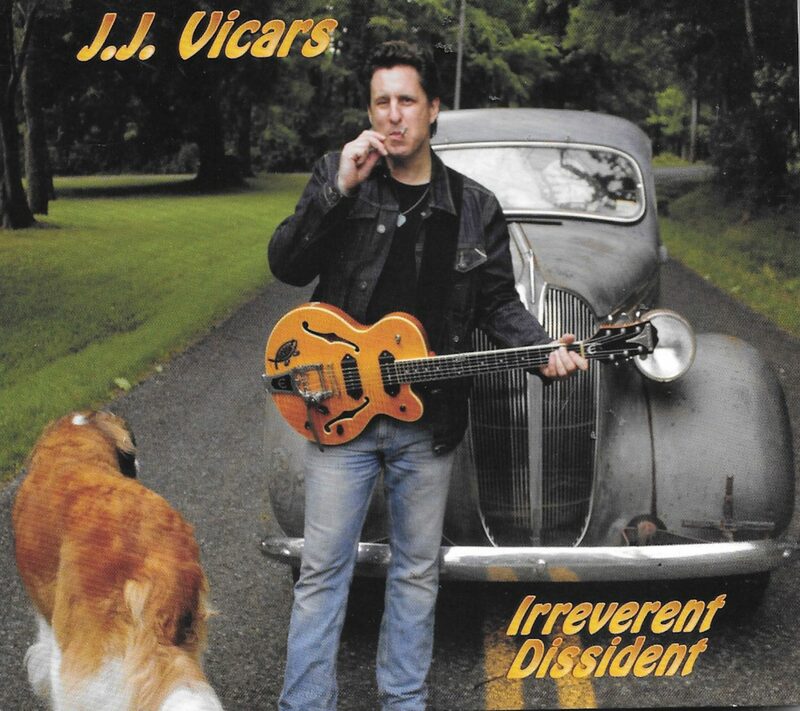 I am starting this review a little self indulgently as, I think, JJ Vicars and I share a very similar view of what constitutes the blues. A few years ago, I had a letter published in Classic Rock Magazine in response to an article in the previous issue on the blues genre. By the way Classic rock, you gave it ‘Star Letter’ status that earned a t-shirt…never did receive it! The letter said: “Loved the feature on Blues & Blues Rock; I must take most of the contributors to task over one thing, however. Blues is not all misery, depression & sadness. Having been ‘turned’ onto the blues in the 1970s by researching the originals played by Rory Gallagher & Jimi Hendrix etc. I find the blues legacy to be full of humour, tenderness & more alternative names for the male & female genitalia than you would believe possible! Try ‘Travelin’ Riverside Blues’ by the wonderful Robert Johnson. It is here you will find the original, immortal line “Squeeze My Lemons, ’til the juice runs down my leg”. Try the unbelievable Lil Johnson from 1936 with “Press My Button” (No prizes for guessing this innuendo). Try Jimmy Gordon’s “My Baby is a Pearl Diver” – she can hold her breath for a long time! Even the instrumentals of the time can raise a smile, like Weaver & Beasley’s “Bottleneck Blues”. Most blues legends sprinkled their songs of hardship with songs about loving, about drinking & about having a good time”. (By the way, Erja Lyttenen does a brilliant cover of Press My Button if you want a modern take on it) That belief is still as strong today and if you approach JJ’s latest album, Irreverent Dissident’ with that mindset, it will add to the pleasure and help forgive any misogynistic references that (ahem) raise their head. This is JJs sixth album and his first since returning to the USA after a decade-long sojourn travelling the world. It still has his trademark guitar sound and smoky blues vocals across the 11 (plus two ‘CD Bonus Tracks) songs. The overall sound is a melding of rock and blues with an injection of swing and jazz to keep it fresh. Apparently, the songs are split into three themes, although this isn’t obvious and, frankly, irrelevant when listening as the pace and subject matter varies and doesn’t really need any links. It opens with a prelude called Los Vatos in A: this is loosely translated as “The Dudes” in A and is a short but atmospheric guitar piece which leads into the first track proper. Long Way From Home starts all Chuck Berry, then sounds like ‘punk blues’ until the guitar solo cuts in with some brilliant phrasing as JJ tells the story of his travels. Next up is a reworking of Willie Dixon’s blues standard, Wang Dang Doodle in which JJ gets the guitar sound spot on as he updates this classic. His vocal is a bit low in the mix, but it does mean you can hear all of the backing, which reveals some clever multiple chord playing. The first solo combines clear picking with hard chord strums and is a delight; the second one is even better. Can’t Get Along With You is a neat take on a Texas shuffle which SRV could have made his own. JJ does the format proud with his laidback approach to guitar that makes it warm yet still has attack. Bill Wheldon’s 30s composition, Outskirts Of Town, gets that same warm feel but this version, courtesy of a jazz piano, makes it a very different cover. It does work remarkably well with an expansive piano solo heralding an exquisitely picked guitar solo. Stinky Twinky is next: this may be a euphemism I’m not familiar with but, regardless of a dodgy title, it is a sub-three-minute instrumental romp that could have been released in the 60s. The guitar is fast and furious as the backing rolls along on rapid bass, drums and horns before a dissonant sax solo by Big Jay McNeely. Downhome is an instrumental that I adore. It has yet more great, vintage sounding guitar that shows JJs capabilities to the full and is addictive. Beware, the sound in the background isn’t a pair of lungs trying desperately for air, it is actually a rather clever piece of Hammond work. Another instrumental follows: Deguello starts off with a Spanish guitar intro that stays subtly in the background as the electric cuts in with a more modern sound. It’s pleasant enough but a bit of a disappointment as, after less than two minutes it fades away. The next track, Things I Need, carries an “Explicit Language” warning…I refer you back to my introduction as it isn’t gratuitous swearing, but more of a couple of what some people regard as distasteful adjectives. It is a tongue-in-cheek approach (not a euphemism) and if you consider that it sounds like a song The Goons would occasionally put into their shows, then the humour becomes even more apparent. (If you aren’t old enough to remember the Goon Show, then think Monty Python or The Bonzo Dog Doo Dah Band). So, think the Goons as played by Frank Zappa and you’re there! It is a fun excursion but not an essential part of this album. That Ain’t Me changes to a country tinge with a little swing thrown in. The background has some sweet slide over the strummed acoustic and moody piano and gives a pleasing take on the country-rock original. What Do I Tell My Heart wraps up the album (unless you buy in a format that gives the bonuses) This is another country rock song but JJ adds an extra dimension from the original with the way he blends the varying guitar sounds to flesh out and intensify the lyrical swing of the tune. This is an album that is both well assembled and good humoured. It has many layers waiting to be discovered and, although there are a couple of missteps, it is still well worth seeking out and listening to with the aforementioned open mind. All songs by JJ Vicars except where noted. Many artists performed over the tracks…if I’ve missed anyone, my apologies…the info wasn’t easy to find.